While today's 3DS-focused Nintendo Direct revealed a few titles that we didn't know about, there were a few pieces of information on those we most definitely do know exist. One of those titles was Professor Layton and the Azran Legacies, which is the last game in the prequel trilogy. We can now confirm that Europe can get its puzzle fix this year, while North America will unfortunately need to wait until 2014. 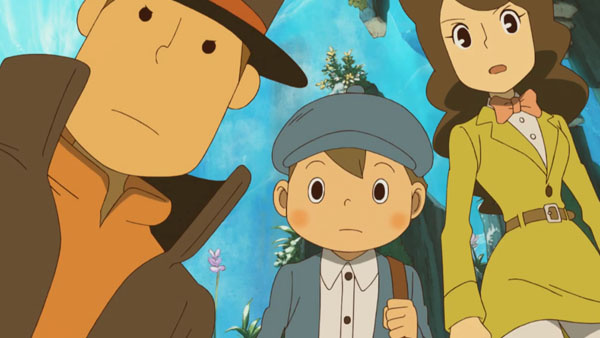 Launched in Japan in February, Professor Layton and the Azran Legacies sees Hershel Layton travel the world with his assistants Emmy and Luke as he attempts to solve the riddles of the ancient Azran civilisation. Naturally, the game features a new set of puzzles - more than 500 according to Nintendo. There's no concrete date yet for the Level 5 puzzler, but we'll be sure to keep you posted about any further developments. What are your thoughts on Professor Layton and the Azran Legacies? Will you be picking up a copy when it gets released? Let us know in the comments section below. Only bummer of the entire Nintendo Direct was learning that North America would have to wait until next year to wrap up their Layton adventures. Most certainly one of my most anticipated games. Of course This is a series that I could play countless entries on. definitely getting this game from the eShop. glad that it is coming out next year because I have enough stuff to get this year that I don`t need too many games to buy. Considering Europe is getting this by the end of this year, I'm hoping that means we'll have it by February 2014. More than 500 puzzles? I'm guessing that includes the daily, downloadable ones (which I believe are making a comeback). I'm honestly not ready to say goodbye to Layton...but I am excited for the game. I think I should get and finish Miracle Mask before I get this one in the installment because I couldnt just say good-bye to Layton on my first his game in his series. That would be kinda sad. Yes! Prof. Layton and the Miracle Mask is currently the most played game on my 3DS (60 hours and counting, I've beaten the main game but there's all the daily download puzzles too ) so this'll be a day one buy for me. Absolutely love this series, they've all been great so far. That's a lot of puzzles. Well, the more the merrier. Day one from the eShop, for sure. But could they please announce PLvAA? I'm very tired of waiting anxiously at this point. That game was the number one reason I got a 3DS in the first place, no joke. This is cool, but I'm more interested in Layton vs. Wright. Though we still may receive PL vs AA this year, I'm still sad that us Americans will have to wait until next year. We're finally getting a game before America. This looks like a fantastic game but I still need to get Miracle Mask.